The kingdom of Oukoku lives in the shadow of the dastardly (and spicy) General Tso. The Sorcerers and Beastmasters of the land have beaten back his armies twice, but have paid a heavy cost to do so: another attack and the kingdom is finished. And yet, the legends foretold of a tiny knight that would one day be the salvation of the land. Are you that knight? Are you that tiny? Well, you'd better be, because you're the only hope we have. 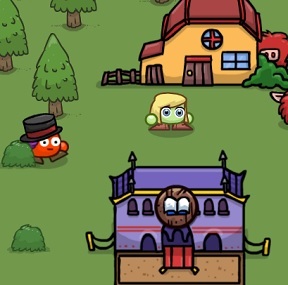 Super Chibi Knight, whose free online demo can be played here, is an platform-RPG-adventure hybrid by the PestoForce team; a team comprised of Nick (age 33) and Bella (age 8) Pasto whose collaboration started with the original Chibi Knight. Move Chibi Knight with the [arrow] keys, and jump with [S]. You perform a basic sword attack with [A]. 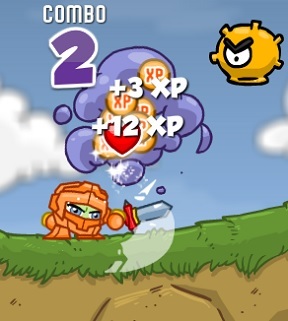 You will find upgrades throughout, including a special fireball attack performed by holding and releasing the attack button. This attack will drain energy from your special meter, as will the Spells or Beast attacks you might learn throughout the game, which will be activated with [D]. Hack-and-slash your way across the world, completing missions to learn new techniques, and defeating baddies to earn XP. Earn enough XP, and you can apply it as an upgrade to you armor, sword, or special meter. (These changes are reflected by changes in your character sprite, which is a nice touch, though Super Chibi Knight does allow you to "lock" your look at various points.) Eventually, you just may become skilled enough to take on General Tso and make the world safe for Chibi (Chibis?) everywhere! Super Chibi Knight's tone is cheerfully retro by way of Zelda II (with the overworld/sidescrolling duality at the least feeling like a direct inspiration). One does not know what individual influences are father or daughter's, but it definitely captures the sensation of the grand NES game plans I used to sketch in my school notebooks as an eight year-old, and I mean that as a compliment. The colors are bold, the explosions are big the characters are memorable, the entire game-world bursts with imagination, and puns are everywhere. There's very little filler here: it's a game so jam-packed with variety that it's almost a little claustrophobic (especially when there are insta-death-spikes you might not realize are underneath you). It's a style that served Pasto so well in Abobo's Big Adventure, and it makes Super Chibi Knight just as addictive. Like Abobo, though, Super Chibi Knight's difficulty level is all over the place, and I choose my words specifically there. It's not a particularly challenging game, as fits its kid-friendly nature, but there are times when it feels unfair. Even with a fairly good checkpoint and autosave system (perhaps too good for the latter, as it can lead to secrets being locked out that you didn't even realize were there to be explored), insta-death-send-you-back-to-the-start-of-the-level spikes abound. When it becomes a matter of making one specific jump or defeating one specific enemy, those restarts can really be a speed bump. Worse yet, it is not always obvious when the problem is that of player skill, or rather that a power-up hasn't been found or that a little XP grinding is necessary. Super Chibi Knight's flow is overall so good, that it's a shame that it can be interrupted by a lack of clarity. But maybe this approaches the title in the wrong direction. Maybe we can grant Super Chibi Knight the benefit of the doubt in re-creating the obfuscation and random difficulty spikes that were also present in the retro games it hopes to emulate. Above all, Super Chibi Knight feels like a labor of love, and there is such joy in the entire presentation. I hope it's not the last father-daughter collaboration (Super Chibi Knight 64?) we see from the two. Hey, I saw this on Steam! Sadly the lag just ruins this game. Also hurt by awkward and unintuitive controls. Could have benefited from simpler graphics for fluid playing.